Loxley Gold Chunky canvas is made from 100% cotton canvas and is primed with three coats of acrylic primer which gives the canvas a medium grain. Suitable for both oil and acrylic paints, the 38mm deep staple free edges allow the picture to continue around the sides of the canvas. Available in a comprehensive range of sizes at discounted prices. Loxley Gold Chunky canvas is made from 100% cotton duck canvas and is primed with three coats of acrylic primer which gives the canvas a medium grain. Suitable for both oil and acrylic paints, the 38mm deep staple free edges allow the picture to continue around the sides of the canvas. Available in a comprehensive range of sizes at discounted prices. Buy any 2 or more boxes of Chunky and Standard Canvases and receive and extra 10% discount. You may mix and match between chunky and standard and sizes. 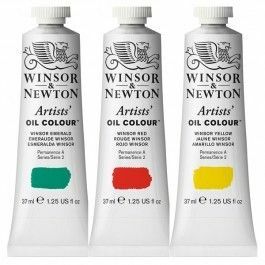 Daler Rowney Artists' quality actylic paint. High pigmented with a heavy body. 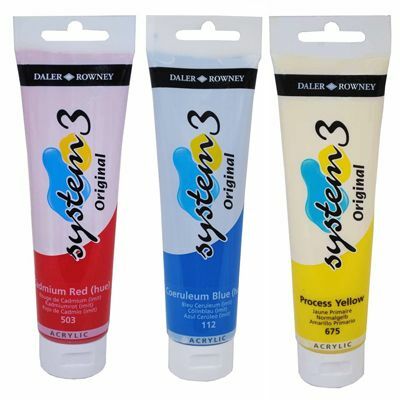 All System 3 acrylic colours can be thinned with water to pale washes, or used directly from the pot or tube; each form dries quickly to create an insoluble film. The quick drying properties of the range enable the artist to work quickly, superimposing or juxtaposing colours without unnecessary fuss.